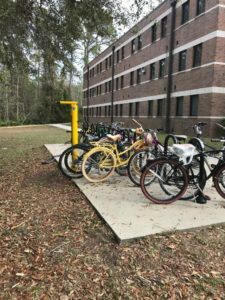 The Adventures in Biking Safely – March is Florida Bicycle Month! Florida’s weather in March is perfect for biking, so get out and ride. With many drivers and cyclists on the road this month, let’s gear up with some bicycle safety reminders. Drivers: Share the road with bicyclists and always pass or follow cyclists with at least a 3 foot barrier. Bicyclists: Wear a helmet, ride on the right and make sure drivers can see you with bright clothing and reflectors or lights on your bike. For more important bicycle safety tips, crash facts and resources, go to our traffic safety bike page here. What a perfect way to kick off bicycle month! 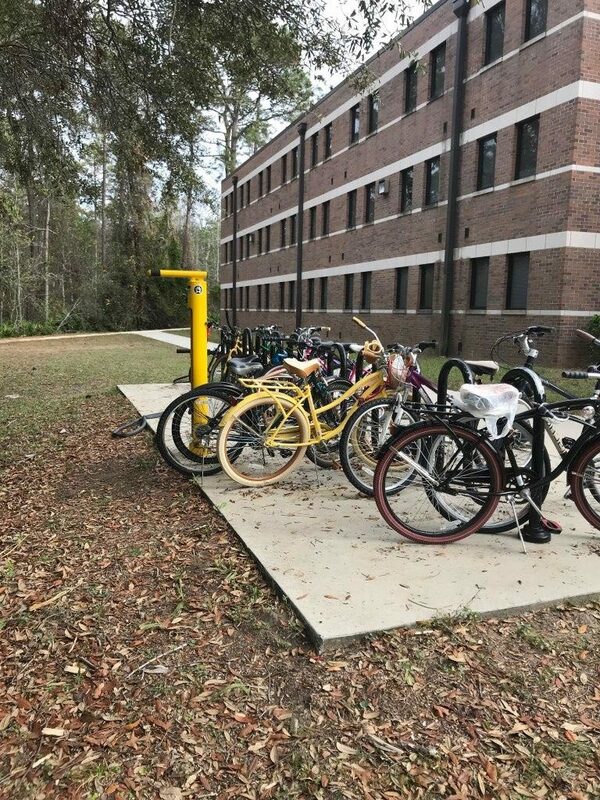 We are excited to share the new bike stations provided by the FDOT Northeast Florida, and located at the University of North Florida. Your Traffic Safety Team worked with UNF Police Department to coordinate the installation and identification of locations for students – great for quick and easy bicycle repairs to help bike safe! 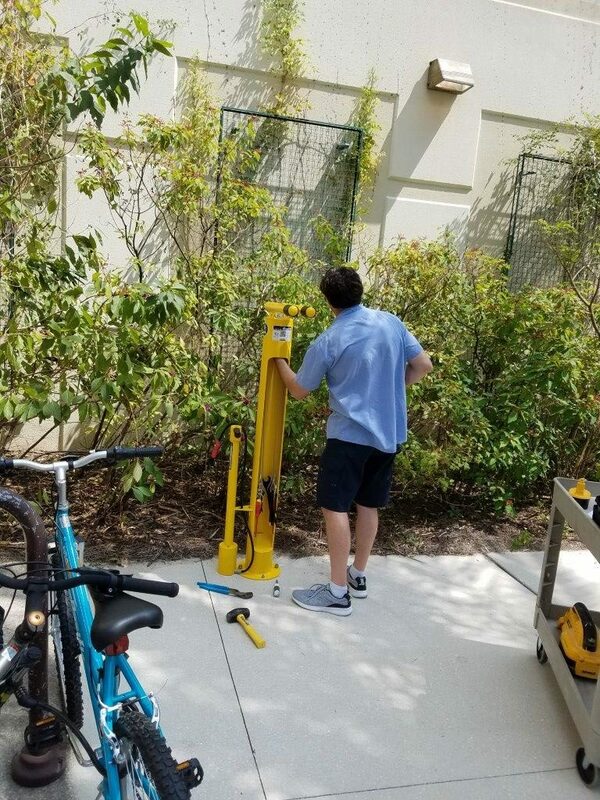 The self-serve bike repair stations are free to use. They contain air pumps along with a variety of tools to help riders work on their bikes. 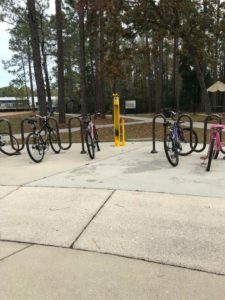 Located around the UNF campus at: Crossings Bike Station Q Building, Fountains Bike Station, Hall Landing Bike Station, and Village A Building Bike Station. Your Community Traffic Safety Team presents this important new traffic system operating instructions. Watch the video above to learn what drivers and pedestrians should do when they approach a HAWK Pedestrian Hybrid Beacon. You may also flip through the book below or download the PDF “HAWK 101 Guide” by FDOT Northeast Florida District Two. 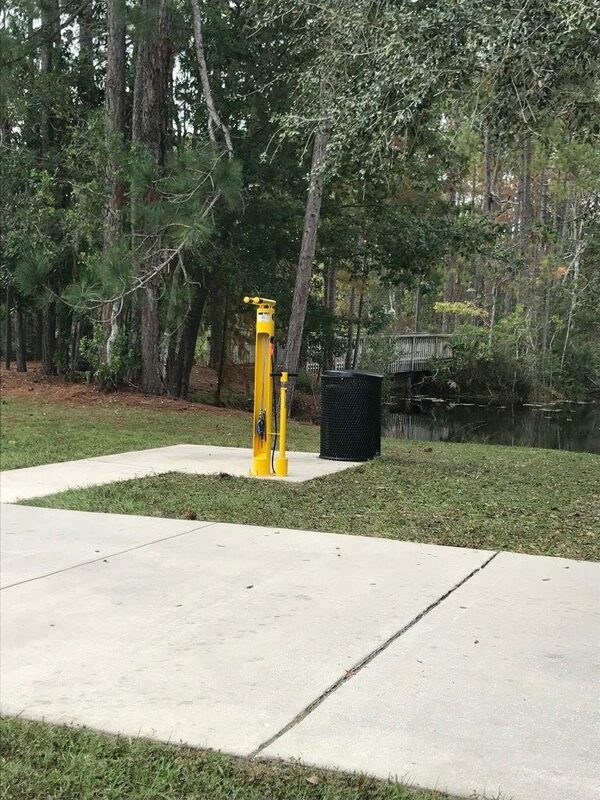 • Drivers will see all indication lights are dark when there is no pedestrian waiting to cross, and the pedestrian signal will maintain a “DON’T WALK” symbol. • Pedestrians who want to cross the street will need to push the button to activate the system. • Drivers will see a FLASHING YELLOW light for a few seconds when pedestrians push the button. Drivers should reduce speed and prepare to stop. • Pedestrians will still see the “DON’T WALK” symbol and should wait. • Drivers will see the flashing go to a STEADY YELLOW light, warning them the indication will soon turn to a STEADY RED light. • Pedestrians continue to see the “DON’T WALK” symbol and should remain waiting. • Drivers will see a STEADY RED light, which requires them to STOP at the stop line. • Pedestrians will then see a “WALK” symbol to cross and should look in both directions to make sure all vehicles are stopped. • Drivers will see ALTERNATING FLASHING RED lights, as pedestrians cross the street. During this period, drivers are required to STOP and then they may proceed with caution if crosswalk is clear. • Pedestrians will see the WALK indication change to a flashing countdown that indicates how much time they have remaining to cross the street. • Drivers will see all lights are back to dark at the end of the flashing countdown and may continue to proceed through the crosswalk if it is clear. • Pedestrians will see the “DON’T WALK” symbol and must push the button to activate the system again. Jacksonville and St Augustine – Cara Filler presented her Drive To Save Lives to many of our local high school students. Cara’s identical twin sister was killed in a crash while driving with her boyfriend, who was speeding and showboating. Cara uses her personal tragedy to educate teens in a positive and “doesn’t feel like learning” way on how to be a safe passenger, how to get out of driving with an impaired or dangerous driver, and how to take personal charge of your own safety. Car crashes continue to be the number one cause of death for our teens. Having this amazing, national speaker available to our schools for free to discuss the importance of teen traffic safety was priceless. Special thanks go out to Florida SADD with grants from State Farm and the Florida Teen Safe Driving Coalition for making these life-saving presentations happen at eight of our schools. Our Community Traffic Safety Team and other educational outreach of groups like SADD and the Teen Safe Driving Coalition continue to do all that we can to drive down teen deaths on our roadways. Our community leaders and partners help ensure teen drivers are provided with the information, motivation and tools that will keep them safe on the road. Cara is a natural speaker, engaging and memorable. This powerful tour will not be forgotten by the students. The video, recorded and produced by Favorite Studios, is only a highlight of the full presentation which lasted about an hour. There was such an enthusiastic response from students and faculty, we can hope to see more of these teen safety events in the future.